From an early age lights at night have always fascinated me. The elements such as rain, sleet, snow and mist gave new life to an established scene. Living in an industrial town reinforced this fascination. The lights of the man made industrial scene created a mystical atmosphere in my fertile imagination. My earlier work was influenced by this scene. 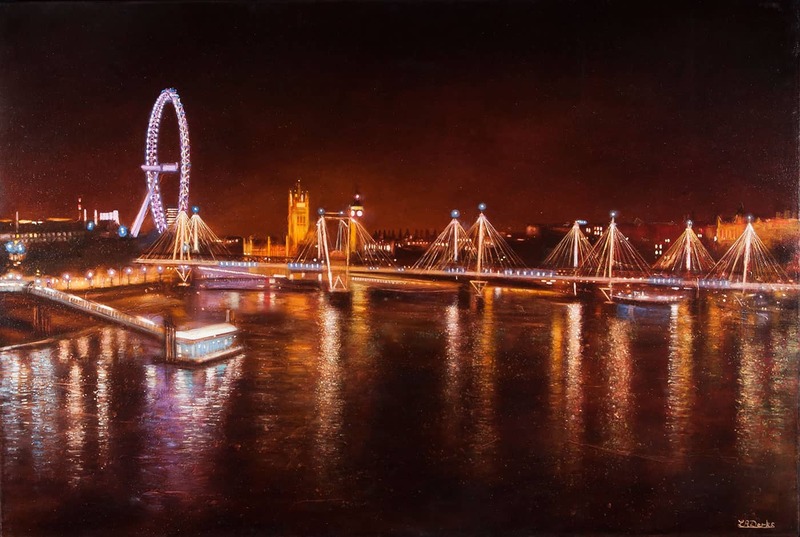 Large halos of colour and twinkling lights suggestive of structure were all incorporated in my work. My work was interpreted by many viewers as something entirely different. Some saw some form of alien worlds, others seascapes and yet others cityscapes such as New York. This has led me on to my current work painting mainly cityscapes. All my work is based on places I have visited over the years. My aim is to produce work that allows the viewer to experience their own version of the subtleties of movement, light and sound that I experience when producing the work. More recently, I have begun to explore lights in a different way, focusing on interiors and in particular chandeliers and the different lights they can convey. My paintings are much more than a depictive representation. They are textured using many layers of different mediums. As the work progresses I omit areas or replace them. I may peel back to an earlier state thereby revealing what went on before. The painting begins to take on a different direction from the original source material.